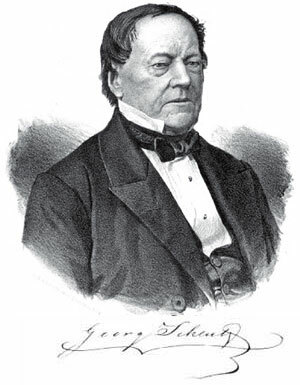 The Swede Pehr Georg Scheutz (see biography of Pehr Georg Scheutz) (1785–1873) was a remarkable man—a lawyer, translator, and inventor. When he read a description of the differential engine of Babbage in 1834, he decided to build such a machine. And, despite of the fact, that he wasn't a mathematician (like Babbage), he was not an engineer, he didn't have money at his disposal, and he lived in a country, which was much behind England in technological point of view, nevertheless he managed to do this. He (with his son Edvard) managed to built the first workable differential engine, and first printing calculating machine in the world. Scheutz initially learned about Charles Babbage and his machine, when he started to translate several chapters from Babbage's very successful book Economy of Machinery and Manufactures, for his Journal för Manufakturer och Hushållning in 1832. From this book Scheutz learned also about the technique of computing mathematical tables, using the "method of differences". Intrigued by this account in Babbage's Economy, Scheutz discovered a more detailed discussion of Babbage's machine, which appeared in the July 1834 issue in the magazine Edinburgh Review, in which the author of the article "Babbage's calculating engine", the Irish popularizer of science Dionysius Lardner (1793-1859), reviewed a set of seven publications pertaining to the machine, ranging from Babbage's accounts of 1822 and 1823 to the 1829 report by a committee of the Royal Society. Lardner not only presented a sketch of several major tables produced over the preceding fifty years, using these to illustrate the difficulty and importance of producing large quantities of error free copies, but also described in relatively non technical fashion, the working of the machine, and Babbage's concept of mechanical notation. 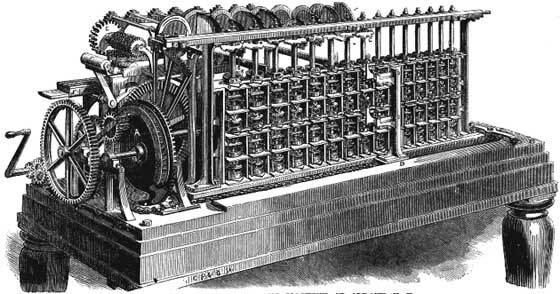 After familiarizing himself more closely with computational techniques and the construction of the Babbage's difference engine, in the beginning of 1837 Scheutz built by some provisional models in wood, pasteboard and wire, which appeared to prove the point. In the summer of the same year, his son Edvard, student in the Technological Institute in Stockholm, asked and was granted his father's permission to enlarge upon the rough model of a difference engine, and produced a metal version. By the end of summer, Edvard had made so much progress with his work, that it seemed perfectly feasible to produce a complete engine. Edvard's progress pleased his father sufficiently, so on the 3rd October 1837, he sent a long letter to the Royal Academy of Sciences. In it he stated that he had discovered a simpler and cheaper design for a difference engine than Babbage had done and offered to build such an improved engine, which inclusive of the stereotype printing unit would be 19 times smaller than Babbage's! While Babbage's engine had cost 15000 pounds in 1829 "and was still unfinished", Scheutz (so he claimed) was able to build an engine for 20000 riksdaller banco (circa 1638 pounds) within an estimated time of one to two years at most. The Academy refused to support the request because it would cost "too much for a country like Sweden with its limited resources". The undersigned take leave to issue the following statement concerning a calculating and printing machine, which they were requested to inspect and which was conceived by the Auditor Mr. Georg Scheutz and brought to a finished form by his son Edvard Scheutz, a student at the Royal Technological Institute, who also has invented several important parts of the machine. 1st—The Calculating unit. This is certainly unable to deal with arithmetical series of a degree higher than the third, and it cannot give complete terms, where more than five digits are called for, but there is nothing in the nature of the mechanism to prevent one from extending its performance to include series of arbitrary degree and terms with as many digits as required. To accomplish this, it is only necessary to supply additional machine-parts, similar to those already existing, i.e. the machine's height and length are increased. In its present state, he [sic] can nevertheless, under certain circumstances, print 10-digit numbers. The last five digits are already given correctly and provided the terms do not grow too rapidly, the 6th together with all the digits to the left of it, are increased by 1 or alternatively, several of the subsequent terms become constant. This mechanism of the machine was supplied with another device, which allowed the missing digits in terms greater than 99999 to be displayed. In our presence, specific terms were correctly presented for five different series of the third degree, supplied by us. Here it may be observed that in the case of decreasing series the machine gave not the negative terms themselves, but their complements relative to 100000. However, if the machine is halted at the term where the series changes from positive to negative and the complements to the differences, arising from that point onwards, are inserted, the negative terms and not their complements result. 2nd—The Printing unit. Each term supplied by the calculating unit is presented in the form of printed digits, arranged in rows close to one another, as in a printed table and the rows are immediately printed in some material, which allows galvanoplastic or stereotype copies to be made. The printing is accomplished by means of ordinary printer's type, which, however, in the case of a larger machine or where the digits had to be printed in copper, would require to be made of steel or some other hard metal, and the rows are set with great accuracy, one beneath the other in the same vertical column. In the test carried out, the digits were printed in a thin layer of lead. 3rd—The Numerator. The printing unit is combined with another mechanism, which before each term prints its corresponding argument. The machine is operated by turning a handle by means of which, without any additional measure, one can carry out both the calculation, arrangement and printing of the digits and rows. In its present form, it occupies a case 2 feet 8 inches long, 2 feet wide and 8 inches high. When placed on a table large enough to support it, it can be lifted and moved, together with the table, by two persons. Finally, it may be noted that the machine, being merely a model, has been built without access to those mechanical tools required for more accurate metal work and it does not therefore possess that perfection which a larger scale model, designed for actual use and executed in more favorable circumstances, would and must possess. Nevertheless, in its present form it is capable of evaluating certain classes of mathematical formulae when the variables involved receive steadily increasing definite values. The abovementioned statement of the scientific committee certified the conceptual and technological soundness of the proposed machine. What remained to translate the working model into a saleable product was supporting capital. This was beyond the means of the Scheutzes. Attempts of Georg Scheutz to find a buyer for a full-size machine abroad (in England and France) failed continuously. In 1844 he applied again for a grant of 10000 riksdaller from the Swedish crown to construct a full-scale model. But the academy, while attesting to the physical possibility of building such a machine, was not prepared to guarantee from its construction an advantage to the nation commensurate with the cost. Lacking assurance that building a difference engine would be in the national interest, the government denied Scheutz's request, and the model lay dormant for some years. In 1851 Georg Scheutz applied again to the crown, this time for a smaller grant of 3333 riksdaller. And again failure, the crown denied for lack of funds. This time however, the Royal Swedish Academy of Sciences endorsed them, and the Swedish parliament (Diet) advanced 5000 riksdaller on the condition that the inventors finish the project by the end of 1853. Otherwise, the money would have to be returned. 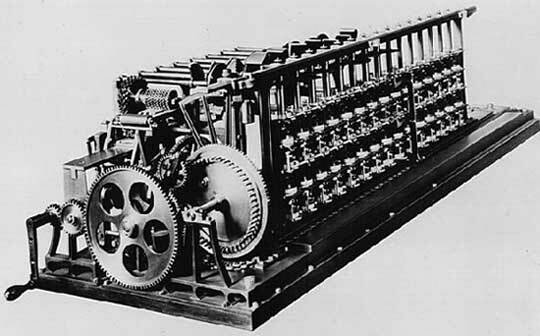 Unlike Babbage, the Scheutzes were an eminently practical pair, and the Tabulating Machine, as they called it, was completed on schedule (though not within the budget and prone to error). The first machine, which was ready in October, 1853, was built under the supervision of Edvard Scheutz in the workshop of the industrialist Bergström. The machine (see the lower photo) could handle numbers of 15 digits and tabulate functions with 4 orders of differences (the fourth being constant) and print out results, rounded off to eight digits, on molds from which metal printing plates could be cast. . The overall measurements of the machine are: 56 cm x 170 cm x 58 cm. All the units and movable parts in the machine were operated by hand by means of a crank. The force applied was transmitted by a system of gears to the cams, arms and racks that operated the calculating unit. Beneath this were two carriages (one of them on wheels), which ran along rails, which were suitably curved to give the five vertical axles their up and down movements. The printing table in the printing unit was acted upon by a crank mechanism. 1. The start values of the table in question were calculated manually. 2. The number wheels in the calculating unit were set at the start values with the help of a special tool. 3. A piece of matrix material, wax, pasteboard or lead, was fastened to the slide on the printing table. Then the slide was pushed in, until the feeding hooks reached the first notch of the ratchet. The numerator was set at zero. 4. The handle of the engine was cranked and after every 6th revolution, a result was printed. The tabular values and differences were represented by number of toothed wheels arranged horizontally in a 15 by 5 array. The top row of 15 figures represented the tabular values; the second row, the first differences; the third row, second differences; the fourth row, third; and the fifth row, the constant fourth differences. At the outset of a computation, the number wheels were set manually. Each wheel had an adding mechanism, consisting of a "catch-and-trap" combination. There is an upward catch, attached to the upper part of the wheel, the corresponding trap to the central axis surrounded by that wheel, at a point approximately midway between it and the wheel above it. As the axes rotated, the traps revolved within the calculating wheels. Each trap had an arm which touched the catch of the wheel below it as the trap revolved. Depending on the direction of this revolution, it either pressed down a portion of the catch and passed it freely, or was caught by it and raised. When the trap was raised, it engaged the number wheel above it, thereby turning it. A related stud and lever mechanism provided for carrying as the upper wheel passed from 9 to 0 (or 5 to 0, in the case of the "sexial" wheels. A small stud between these two digits pushed against a lever when a wheel passed from 9 to 0. This lever extended to the left in front of the preceding wheel. The carrying action was prompted by a moving upright "pillar." If the stud had pressed against the lever, this then came into contact with the pillar, causing a pivot arm on that pillar to engage the wheel behind the lever and to move it forward one unit, thus effecting the carry. 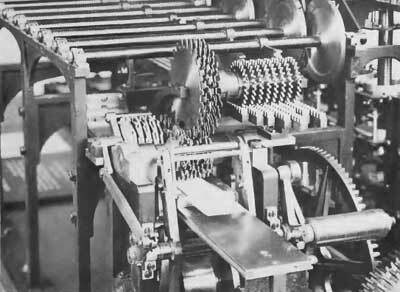 The printing mechanism (see the upper photo) was joined to the top row of the machine, because only final values must be printed. A set of horizontal shafts was placed at right angles to the rows of number wheels. By means of a set of eight cams and "snails" (stepped cylindrical segments) these shafts linked the vertical axes corresponding to the eight leading digits to a set of racks geared to eight type wheels. The racks were parallel to the rows of number wheels. A bar kept the type wheels stationary while the machine added. Once the calculations had been completed, the bar was removed, releasing a set of weights. Being suspended from disks attached to the horizontal shafts, these weights were connected to the eight leading number wheel axes by the snail and cam combinations. Upon release, they set the type wheels into action, impressing 8-digit figures onto 8-inch-long strips of paper. These strips were usually covered with black lead to facilitate production of stereotype plates from them. 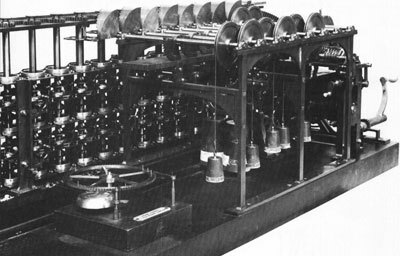 The Scheutz Difference Engine was powered by falling weights, as can be seen on the photo below. In the end of 1854 Scheutzes and their machine traveled to England with the help of the firm of Bryan Donkin, a famous English engineer and industrialist, who in 1829 assisted to Charles Babbage for creating of his differential engine. They immediately applied for a patent, which was granted next year. The machine was opened for demonstrations and a number of english newspapers and magazines presented reviews of the patent and descriptions of the machine. In 1855 a committee appointed by the the Royal Society examined the machine and noted that although Scheutz had adopted Babbage's suggestion of operating oppositely on odd and even differences, so these could be handled simultaneously, the mechanism of the Scheutz machine is different from Babbage's. For the surprise of many, Babbage (ever the gentleman) himself not only demonstrated a positive attitude to the machine, but in the following years he will support quite strong Scheutz, despite of many problems. This machine, among the most ingenious, solves equations of the fourth degree and of even higher orders; it operates in every number system; in the decimal system, in the sexagesimal system (for trigonometry) or in any other system... Scientists who vaunt their calculating powers, as a divination of the laws of nature, will be advantageously replaced by a simple machine, which, under the nearly blind drive of an ordinary man, of a kind of movement, will penetrate infinite space more surely and profoundly than they. Any man knowing how to formulate a problem and having the machine of the Messieurs Scheutz at his disposal for solving it, will replace the need for the Archimedes, the Newtons or the Laplaces. And observe how in the sciences and arts, all is held together and intertwined: this nearly intelligent machine not only effects in seconds calculations which would demand an hour; it prints the results that it obtains, adding the merit of neat calligraphy to the merit of calculation without possible error: the stereotyped numerals emerge grouped at the will of the operator, and separated, as he desires, by blanks, lines or any arbitrary typographic symbols. If a simple machine can tell us the distance of stars, the extent of celestial globes, the path which the great comets traverse on their parabolic course, what limit can henceforth be assigned to mechanism? What world of impossibilities will not be cleared? The gold medal gave the Scheutzes the recognition they deserved. It also attracted a buyer, which the pair had been searching for almost from the day they had completed the machine. In 1856 the machine was purchased for £5000 by Dudley Observatory at Albany, New York, USA and the next year was transported to the USA, where it was used for the first practical work—a computation of the True Anomaly of Mars. At the same time in England, a second Scheutz difference machine was being put to work. In 1857 the British government authorized the sum of £1200 for a full-scale difference engine with attached printing apparatus based on the design of Scheutz to be constructed by Donkin's company. The new machine was almost exactly as first (with only small variations in design) and handled 15-place numbers to 4 orders of differences and could transmit 8 places to the printing mechanism. Costs overran and Donkin delivered the machine in July 1859, several weeks past the deadline, incurring a loss of £615. The machine was used at the General Register Office to compute life tables, which were published in 1864.